Born in Scotland a long, long time ago, and moved to Canada at an early age. 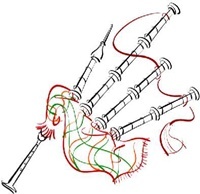 Graham started Piping at the age of six, he then joined the White Hackle Pipe Band from North Vancouver, BC. Five years and 10 instructors later Graham joined the Seaforth Highlanders Cadet Pipe Band of Canada. He was the youngest person ever to join the Cadets. This is when Graham met Ed Esson MBE. Ed started Graham down the right path and introduced him to Donald Macleod MBE at the Nelson School of Piping. In the mid 70’s, Graham left the Seaforth Highlanders to join the Triumph Street Pipe Band under the direction of Hal Senyk. Triumph Street went overseas to compete at the World Championships and in 1979 Triumph Street placed fifth; the Drum Corps won the World Drum Corps Championships. This was the first time a major award left Scotland in the Grade 1 contest. Graham later joined and became the Pipe Major of the Maple Ridge Legion Pipe Band. In two years the Band went from a humble Grade 3, to winning prizes in Grade 2. Graham was the Band Manager and Instructor for the White Spot Pipe Band. The Band was the BCPA Grand Aggregate Champions 8 out of 10 years (2000 to 2010). This Band takes on beginners from 8 to 14. Members may play till they are 18. Three times Finalist at the BC Piper’s Association Knockout competition, Graham was an Instructor at Coeur d’ Alene School of Piping and Drumming. Graham is an International Teacher, Judge and Recitalist. Graham formed a new Grade 3 Pipe Band in 2004. Greighlan Crossing Pipe Band has traveled to China twice, and has competed all over the Pacific West Coast including Pleasanton, California. They were the BCPA Grand Aggregate Champions 4 years in a row from 2013 to 2016. Graham served as President of the BC Pipers Association for 4 years overseeing all aspects of the organization and worked with a great team of devoted individuals. Recently married, Graham now lives on Vancouver Island in the Nanaimo and District area.